Commence to placing finger guns to your temple (or under your chin). 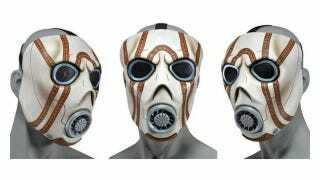 NECA, makers of all sorts of plastic goodness for gamers, will have a latex Psycho mask from Borderlands 2—and another for insufferable baddie Handsome Jack, available in September. The quick-and-dirty cosplay deploys in time for the New York Comic-Con (and Halloween) for $26.99 each. Jack's below. You can get Jack here, or the Psycho here.